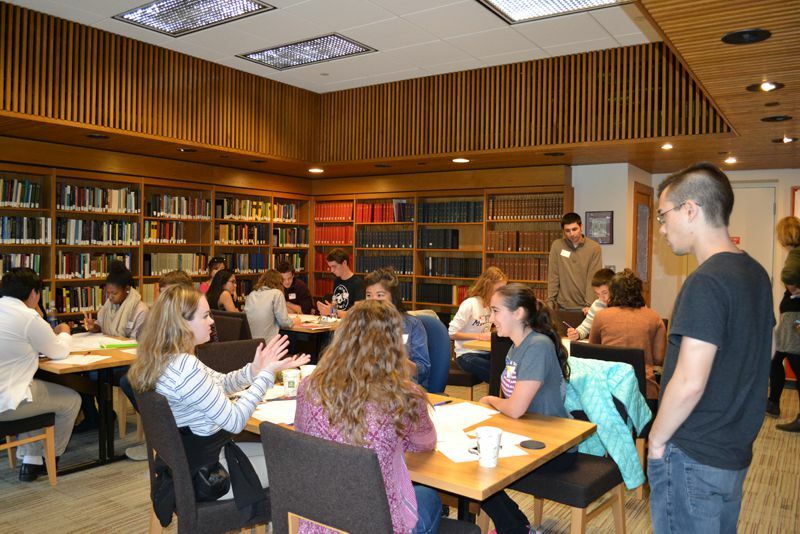 A2Ethics held its first-ever Ethics Bowl case writing competition for Michigan high school students in April 2017. The aim of the competition is to discover philosophically-minded student writers across the state and involve them with ethics issues in a newly collaborative and practical way. Winning cases will be considered for inclusion in regional case sets written by the National High School Ethics Bowl case writing committee. Prior winners have been selected for the case sets, and you can see all prior cases here. Case studies are due to info@a2ethics.org by March 1, 2019. 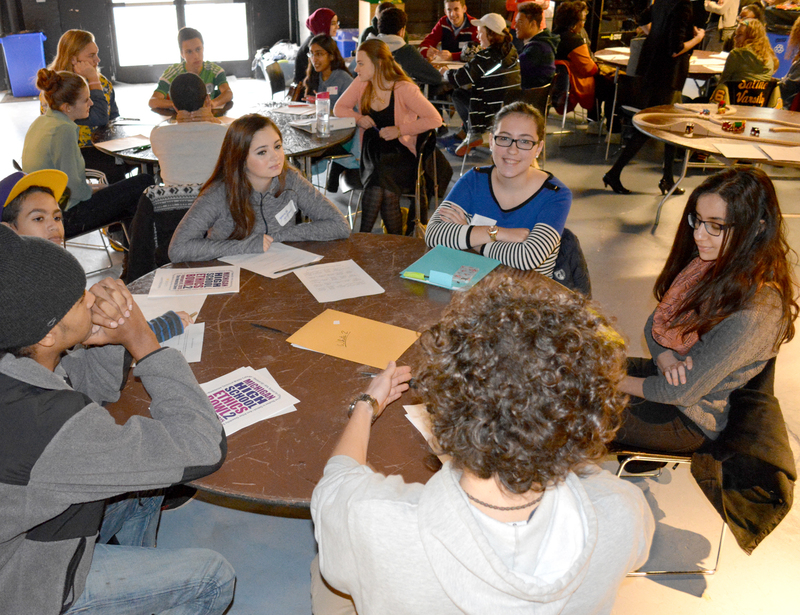 A2Ethics promotes and organizes the annual Michigan High School Ethics Bowl. Now in its fifth season, the Michigan High School Ethics Bowl is an extracurricular program for high school students interested in learning about ethics and philosophy through the examination and discussion of ethics case studies. To run the program, we rely on our exceptional partners: the University of Michigan Dept. of Philosophy Outreach program grad students who teach the fundamentals--and the teachers of the League schools who involve their students. We also depend on case writers from Michigan. Case studies are the essence of ethics bowl competition and the fundamental building blocks of the discussion. We hope to recognize talented young writers and ethicists on the issues they’re passionate about, as well as expand awareness of opportunities around the bowl. With the case study competition, students pose their own dilemmas to their peers and to others. By writing a case study about an ethical dilemma. In addition, there is a prize. One first place winner and two honorable mentions will be selected, with prizes of $350 and $150 respectively. The deadline to submit case studies is Friday, March 1, 2019 by midnight. Please submit case studies to info@a2ethics.org. Want to learn more? Below are the guidelines you will need to know. Any student currently enrolled in a Michigan high school. 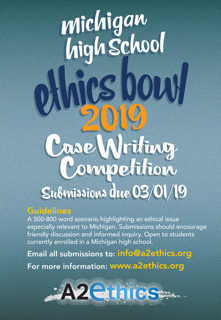 Imagine and then write a scenario or story of 500 to 800-words that identifies a real world ethical dilemma or current ethical issue that may have special relevance to Michigan high school students. The scenario has to be original and never published. Include both background of the scenario, and several questions that pinpoint the ethics issues at play. Keep in mind: it's an ethics case, not a legal brief, medical history narrative or business presentation. For examples, check out the case archive for the National High School Ethics Bowl or the winning cases written last year by students. Cases can be written by individuals or by a team. If you write a collaborative case, all authors must be given credit for their contribution. You may be listed as an author on up to three cases. If we see your name on more than three, we will think you haven't read these guidelines and rules...and your submissions won't count. How will the cases be evaluated? There are three judges, all from Michigan and all skilled and experienced in evaluating case studies. They will also have a strong background in or familiarity with philosophy and ethics. All submissions will be formatted so that none of the judges will know author identity. Cases will be judged on the basis of: sufficient factual information or background; clear understanding of moral and ethical dimensions; organization and clarity of writing; consideration of possible multiple perspectives; and relevance to a Michigan audience. The rubric can be found here. 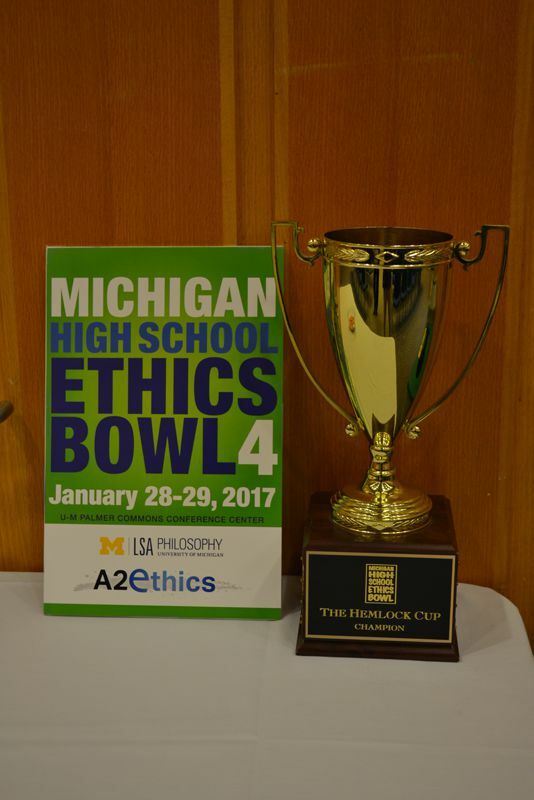 The winner of the competition will be announced on March 17, 2019, at the 2019 Michigan High School Ethics Symposium, our end of the Bowl season event with our partners in the U-M Dept. of Philosophy Outreach program. The Symposium event welcomes both students who have submitted new case studies from schools not yet participating in the Bowl--and students who are already members of the Ethics Bowl League. In addition to presenting newly written case studies, The Syposium gives students other options: introducing an ethics topic of their choice; and examining in greater depth an aspect of a previously published case study from the Ethics Bowl. What Is The Case Writing Competition For? 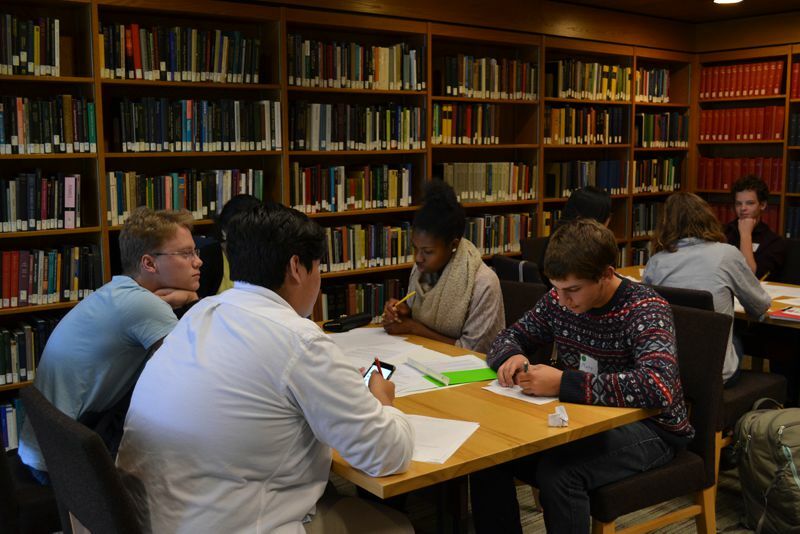 The annual Michigan program culminates in Bowl Day, a judged tournament where all teams present and discuss ethics case studies to win the state championship and to represent Michigan in the annual National Bowl at the University of North Carolina. The winning case from this competition may be included in the National Bowl or as part of other regional bowl case sets. And published later on in the student case anthology of the Ethics Youth Council. 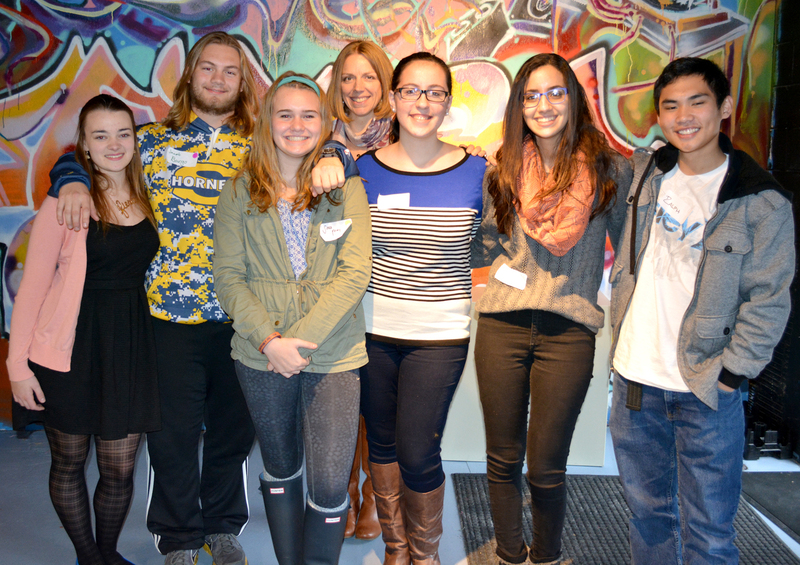 The Ethics Youth Council is a group of students from Bowl League schools interested in promoting philosophy and ethics in their schools through participation in the annual Bowl. 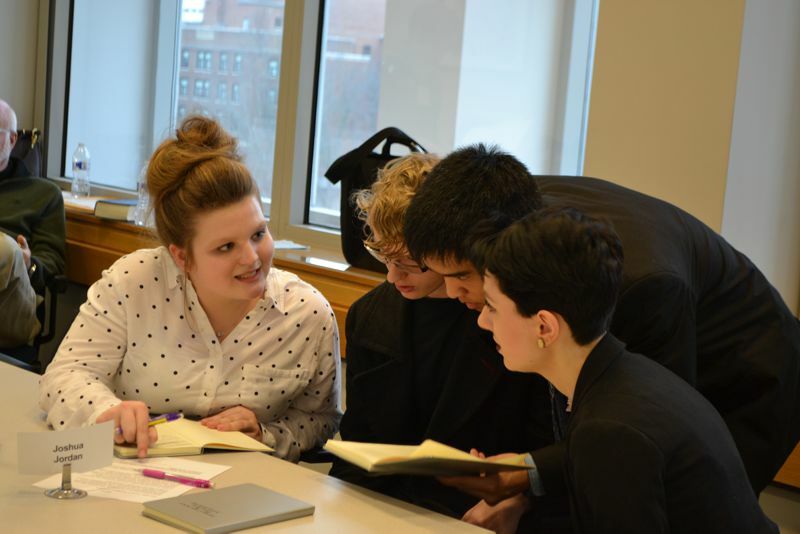 How can I publicize the competition and the Michigan High School Ethics Bowl? You can also share the video of the 2018 Bowl to show what makes the case studies worth writing. Are There Additional Guidelines and Rules? All cases may be edited before use and all cases written for the competition will become the property of A2Ethics.org. At the same time, all submissions can be included in current and future case sets, in full or in part, including ones not selected as winners.